From Bosnia to Iraq to Libya, the UK has failed to learn from its disastrous history of neglecting post-war planning. 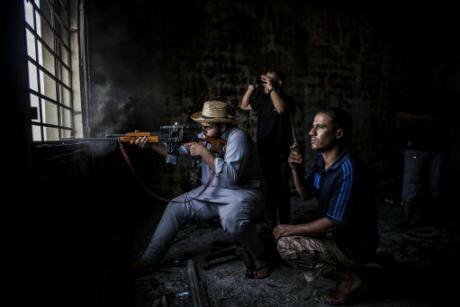 Fighters in Libya fire at Islamic State military positions. Photo: Manu Brabo / AP/Press Association Images. All rights reservedFor the second time this year, a parliamentary inquiry has examined a British military intervention that resulted in the collapse of a dictatorship, and found a disastrous lack of planning for the aftermath. After Iraq in 2003, came Libya in 2011. But the history of failures in long-term planning following British intervention in conflicts stretches back to long before Iraq; I experienced similar problems when working in Kosovo and Bosnia. Why does this keep happening? One reason is a failure to take basic rights and the rule of law seriously in the critical months after fighting has ended. In the summer of 2011, Human Rights Watch documented serious human rights abuses by the Gaddafi government, but also the failure to protect basic rights in the growing amount of territory under opposition control. Our information on Gaddafi’s crimes was welcomed in NATO capitals; our concerns about opposition abuses much less so. Western countries displayed a profound lack of interest in addressing abuses by the armed groups they supported - and this became even more apparent when those forces took power. The UN Human Rights Council had set up a Commission of Inquiry on Libya as unrest began in February 2011. It reported on serious rights violations in the country in the year that followed, including by anti-Gaddafi forces. But the Council - with the strong support of Britain - shut down this Commission in early 2012, a few months after Gaddafi was toppled. UK officials told Human Rights Watch that such monitoring was no longer needed, and that the new Libyan government objected to being monitored. And although a UN mission was set up in Libya with a substantial human rights component, it decided to focus on elections rather than rights abuses. The result was that, at this critical time, there was little public scrutiny of what was going wrong. Another key mistake was not to focus on the rule of law. When the governing structures of a country collapse, as may happen at the end of civil war, one of the urgent tasks is to ensure basic rule of law so that crimes, both serious and petty, can be dealt with by a functioning police force and justice system. This cannot be delayed; if a law and order vacuum emerges, those with guns will quickly fill it. Creating a robust justice system means ensuring there is a police force that has clear powers but also respects the rule of law and basic rights. It also needs, from the start, a detention system where people are held on a clear legal basis and are brought before a judge as quickly as possible. All of this was clear to those of us who had worked in post-conflict missions in the Balkans a decade before. Between 2002 and 2005, Paddy Ashdown was the de facto ruler of Bosnia-Herzegovina on behalf of the international community that had intervened in the conflict. He warned in 2003: “in Bosnia and Kosovo we paid a bitter price for not establishing the rule of law early. It is not a mistake we should repeat in Iraq.” But that error was indeed made in Iraq in 2003, and then again in Libya in 2011. On a hot day in September 2011, I sat in a stuffy room in London and listened to leaders of the Libyan opposition and British officials present a plan for security in post-Gaddafi Libya. They announced that Tripoli would fall within weeks - (they were right) - and assured us they had a plan to ensure Libya would not fall into chaos like post-invasion Iraq. After about an hour of talk about the need for police and military to ensure security, I asked about judges and detention, which had not been mentioned, and was told that the justice system would be set up later. But ‘later’ never came. Instead, without basic judicial review of detention, five years on thousands remain arbitrarily detained by militias and others. And while Libya’s post-2011 rulers did create new forces for policing and detention, they have turned out to be answerable to no one. What is striking, five years on, is the naivety of British and other officials whose attitude seemed to be to hope that everything would turn out for the best once Gaddafi was gone. It is deeply dispiriting that the mistakes made in the Balkans 20 years ago were made again in Libya in 2011. In fact they risk being repeated in Libya in 2016, where there is scant discussion on how to build rule of law if and when the conflict there finally subsides. We keep hearing that “lessons have been learned”, but they seem to be just as quickly forgotten.